Brand New Powerful Industrial Grade Whole-Steel 120 Watts Digital Ultrasonic Cleaner With Large 3 Liter Stainless Steel Tank And 200 Watts Heater. With two sets of strengthened ultrasonic transducers. Ultrasonic Cleaning Power: 120 Watts. Whole Body in Stainless Steel --Anti-Acid and Alkaline. Safe and Efficient Heater - Enhance Cleaning. Special Design - Suitable for Various Industrial Environment. Very reliable machine -- defective rate less than 1% in five years. For Professional Cleaning Jewelry, Watch, Lab Devices, Optics, Coins, Parts, Dental, Tattoo Equipment. 120 watts cleaning power, digital display, and all stainless steel construction with 200 watts heater. This brand new Large Industrial Grade Digital Ultrasonic Cleaner has powerful transducer and heater and large tank capacity for superior cleaning results, making it great for professional cleaning. It is utilization of digital program in ultrasonic cleaner to control the unit, according to the quantity and condition of the items to be cleaned to choose a working cycle. As a result, it is more convenient and the cleaning results are more remarkable! Ideal for scientific labs, medical and dental clinics, tattoo shops, jewelers, opticians, watchmakers, antique dealers, and electronics workshops, golf club etc. For personal and home use. Jewelry, watches, rings, necklace, earrings, diamond, bracelets. Glasses, sunglasses, contact lens accessories, optical lenses. Dentures, combs, toothbrushes, electronic shaver head, razors, and dining appliance. Pen-heads, printer-heads, signature chops, watch parts, ancient coins, badges, valves, machine nozzles, small silverware. Electronics components, mechanical parts, and firearms. Tattoo guns and tubes, and piercing. Large tank -- Suitable for long dental equipment and tube. Tank Capacity: 3 liter and to the Max. Tank Size: 9.63" (L) x 5.63" (W) x 3.75 (H). ALL STAINLESS Construction (body, tank, cover and mesh basket) -- Anti-Acid and Alkaline, resists damage from chemical spills. Two sets of s trengthened transducers make the ultrasonic more powerful (40 KHz and 120 Watts ultrasonic cleaning power) and provides remarkable cleaning results. Digital program cleaning cycles ranging from 5 to 50 minutes--easy to operate. Heater -- Powerful heater (200 watts) makes the temperature reach the presetting one quickly -- significantly enhance cleaning. Heating and ultrasonic cleaning can work in the same time. Digital temperature control with temperature ranging from 20 to 65 degree in Celsius (68 to 149 degree Fahrenheit). Circuit protector --- Protect the circuit to lengthen unit life. Wet-proof PCB --- Good to be used in lab. Some Industrial spare parts being adopted, allows its working in long time frame, and in dampness environment. Three separable wires -- Safe and convenient. Industry IC -- To be steady in unstable voltage condition. Power Supply: AC 100-120V 60 HZ. 9.63" (L) x 5.63" (W) x 3.75 (H). 12" (L) x 6.5" (W) x 10.5 (H). This is the most reliable ultrasonic cleaner. The factory has more than 20 years experiences in manufacturing ultrasonic cleaners. We have service center in USA. We provide lifetime support for our products. We offer the best prices of its kind on Internet. The most important thing is that our product is of quality. Our design is innovative, we choose industrial grade quality circuit elements, we have advanced production line and test machines, and we have very strict quality control procedures. We are sure you will have many years of trouble free service from our ultrasonic cleaners. Considering the ultrasonic cleaning powers when you choose a ultrasonic cleaner. When you choose an ultrasonic cleaner, besides considering the tank size, it is important to choose a ultrasonic cleaner with more ultrasonic cleaning powers. You can compare the ultrasonic powers (watts) per volume (for example, liters) among different cleaners and choose one with a bigger power rate. Please note that heating power is not ultrasonic power. For example, in this case, ultrasonic power is 120 watts, tank capacity is 2.70 liter -- power/volume = 120 watts / 2.70 liter = 44.45 Watts/Liter. If a cleaner has2.5 L and 50 watts ultrasonic power, that data is 50 watts/2.5 L =20 Watts/Liters. The former's ultrasonic cleaning strength is double the latter's. The following video shows the ultrasonic cleaner is at working -- very powerful. 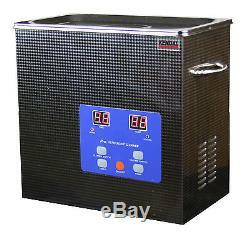 5.5 liters450 watts heated ultrasonic cleaner. 1.4 liters 60watts ultrasonic cleaner. UPS requires a physical address, no PO boxes and APO address please. All presumed defective or wrong items must obtain a Return Merchandise Authorization Number before returning. The item "New Industrial 3 Liters 320 Watts Digital Heated Ultrasonic Cleaner EF3000B" is in sale since Friday, July 17, 2009. This item is in the category "Business & Industrial\Healthcare, Lab & Life Science\Dental Equipment\Dental Lab\Dental Lab Equipment". The seller is "e-fortune" and is located in Middletown, New York. This item can be shipped to United States, to Canada.